In the years immediately after the Second World War, a small group of artists and intellectuals in London envisioned a new kind of cultural institution. Their belief that the arts could play a major role in revitalising a society desolated by the experience of war finally led to the opening of the Institute of Contemporary Arts. The key figures, the poet and art critic Sir Herbert Read and the Surrealist painter Sir Roland Penrose, shared a Modernist vision of an attainable utopian future which shaped the mission and programme of the ICA. They sought to reflect the diversity of a living society, rather than reduce it to a homogeneous system. Thus, over the past 50 years, the ICA has established a unique history, and archive, of interaction between design and contemporary art in the constantly changing social environment of the post-war era. The founding members’ international connections – most notably those of Roland Penrose with Parisian art world figures such as Max Ernst, Georges Braque and Pablo Picasso – made possible the inaugural exhibition, which was crucial in several ways. It set out the ICA’s agenda; it marked the first major meeting between the ICA and the general public; and it tried to create a foundation for the understanding and appreciation of twentieth-century art. It was also a huge success, bringing the ICA to the attention of the general public and, more importantly, establishing its credibility among potential financial supporters. By the end of the first year, ICA events had included poetry readings by W. H. Auden, T. S. Eliot, Dylan Thomas and Louis MacNeice; a talk on modern architecture by Sigfried Giedion in conjunction with the Mars Group; a contemporary chamber music concert by Dallapiccola, Berg, Stravinsky and Buch, followed by a discussion of twelve tone music; and a premiere of Rossellini’s Paisà at the Academy cinema. Its programme was already eliciting the public commitment and controversy the ICA’s founders had hoped for, but not the financial support, a situation that would continue to characterise the organisation over the years. 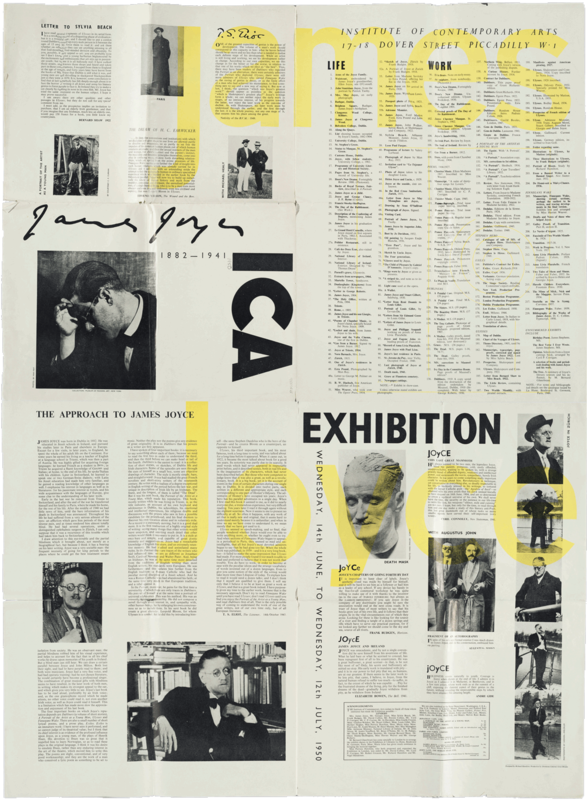 Top: Richard Hamilton’s folding poster / catalogue for ‘James Joyce: His Life and Work’, 1950. 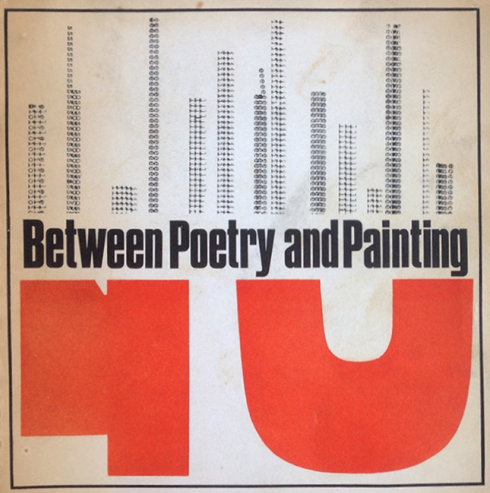 Below: Cover of Between Poetry and Painting comb-bound catalogue, 1965. Design by James Meller. In 1950, the ICA moved into its first permanent premises, an 800-square-foot house in Dover Street, near Piccadilly, in London. Eduardo Paolozzi, Nigel Henderson and Richard Hamilton, who helped to create a new focus of contemporary art outside the traditional system, decorated the house for the opening party. The first major exhibition at Dover Street, ‘James Joyce: His Life and Work’, was of the Irish writer’s literary ephemera. The event included lectures, readings and radio features, and made clear the ICA’s early ambition to explore the intersections and cross the boundaries between different art forms and media. The exhibition was opened by T. S. Eliot, and Richard Hamilton was responsible for its entire design. The catalogue – actually a 30in x 40in (76cm x 101cm) folded sheet – combined on its front Joyce’s signature, a portrait of the writer by Man Ray and the three large letters, I, C and A. Semi-unfolded, it reveals a list of all the objects displayed in the exhibition, and completely unfolded it is transformed into a poster featuring photography, quotes and an introductory essay by Eliot. Hamilton now describes it as an amateurish piece of work, but nonetheless survives as an important example of how exhibition and catalogue were being conceived as one coherent unit. While some events at Dover Street were programmed by committees and individuals, others happened in a more spontaneous way, attracting a broad spectrum of people interested in the arts and providing an informal forum for discussion, criticism and practice. The institute, which Hamilton remembers as a ‘very cliquey, exclusive club’, became a platform for many artists of the post-war avant-garde, where they could experiment in an open yet challenging context. Inevitably, a new group of artists emerged from it. The radical architecture group Archigram put on ‘Living City’ in 1963, describing it as an ‘exhibition-experience’. The Archigram members, with Peter Taylor, designed the catalogue in the iconoclastic collaged style they typically used to present their urbanistic and architectural ideas. Hamilton intended ‘an Exhibit’, staged two years later, to represent ‘a new kind of idea. I wanted to design the show as something you couldn’t conceive on paper, and make the exhibition into an artform in its own right – an exhibition about an exhibition. It was about playing games with structures. It wasn’t just about architecture or sculpture or interior design’. The catalogue introduction describes how, ‘Visitors to ‘an Exhibit’ are involved in a game: the game is the structure of the exhibit . . . 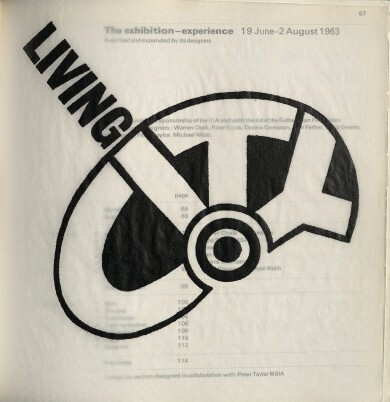 The visitor is asked to look for neither separate works of art nor for symbols but to inhabit, for the duration of the game, a real environment.’ Another poster-style design, it had an initial size of 5in x 10in (12.5cm x 25cm) and involved the audience in a playful unfolding until they reached its final size of 20in x 30in (50cm x 75cm). The exhibition’s multi-layered Perspex panels mirrored the folded tracing paper of the catalogue. ‘Right from the start, the fold is important,’ says Hamilton. ‘Each field is designed for itself and creates a kind of excitement. The folding and unfolding of the poster keeps creating something different.’ The Independent Group’s agenda had a lasting impact upon the ICA, and on British art in general, and its exhibitions put into practice Herbert Read’s vision of modernity. Its members’ overriding enthusiasm was to create an image of the new and to redefine the image of the avant-garde, combining popular cultural forms, fine art and design in complex systems which paralleled the hybrid nature of contemporary culture. Ultimately, they could even move beyond modernity itself. In 1968, the ICA moved into the spacious and elegant John Nash terrace in The Mall that it still occupies. The relocation symbolised a new phase at the institute, as well as in the art world. By the late 1960s, a variety of newly established forms had begun to emerge, including performance, video and installation art, creating a demand for greater flexibility in the presentation of work. Its new home allowed the ICA more scope and enabled it to grow into the larger organisation that it needed to be. Since the ICA had never seriously considered its public representation in any other way than through its art, the ICA graphic archive of the 1950s, 1960s and 1970s reveals not so much an identity as a non-identity, exemplified by the absence of an ICA logotype. With the emphasis placed upon the event, and not upon its context, the design work done over the years involved a huge range of styles, approaches and production methods, from messy ‘undesigned’ invitations to elaborately conceived artist-designed books. No one, it seems, apart from the organisers of the exhibitions felt responsible for the catalogues. At their best, they were designed by the artist or curator, or in collaboration with a designer. Lawrence Weiner’s minimalistic catalogue for his exhibition in 1976, for example, is conceptually integrated into the presentation of his artwork. At their worst they are bad typesetting jobs. By the mid-1980s, the establishment of at least a consistent logotype had come to be seen as essential, to unify the institution and to attract sponsors in a more formal way. In 1986, an ICA logotype was commissioned by Bill McAlister from designers Red Square. Their chunky sans serif solution was inherited by designer Jane Harper when she joined as publicity director – a role created for her that combined design and marketing – later that year. ‘I couldn’t change the logo because it was so new’, says Harper, ‘but I did amend it, altering the letter-spacing and making the C bigger to suit the scale of the I and the A. It had also been designed always to be reversed out of a bar, which I didn’t adhere to. 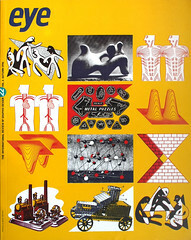 Conceptual art is rendered with rigour in a poster by 8vo, 1986. A collaboration ensued which demonstrated the importance marketing could have in helping the ICA to fulfil its role in the 1990s. Arefin designed a new, strongly geometric uppercase only typeface, derived from the 1980s ICA logo, which he named Housefont. It was to be used in conjunction with the existing logotype, and the newly launched Meta and Scala which, along with Akzidenz, he chose as the corporate typefaces. He then laid down simple guidelines to be observed by himself and freelance designers: Meta, Scala or Akzidenz must be used in every piece of design work, along with any other font of their choice; leaflets must conform to the new (larger) size of 129mm x 210mm; and the logotypes developed for each department must be used. 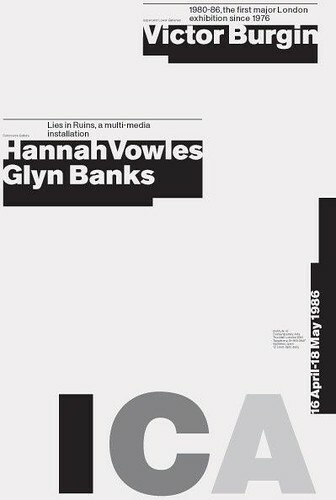 Arefin wanted to re-establish the notion of identity through non-identity, as well as using new design ideas to represent the changed organisation the ICA had become over the years. Operating as an art director, he approached his work at the ICA as a corporate project, but treated each separate design commission as a one-off. He still regards the work done during his time there as a successful application of commercial art: ‘I knew the identity was working when other designers wanted to work for the ICA,’ says Arefin, who had to relinquish his involvement with the institute when he left London in 1994. Maybe more importantly, membership increased considerably during that period due to an exuberant campaign using an upbeat range of images based on Smarties and sweet-wrappers that could hardly have been further from traditional art-house marketing. According to Sender, certain stunning typographic confections have been too indecipherable to do the job. Recently selected designers were invited to submit new corporate identity concepts. The chosen one will be implemented from when the ICA begins its fiftieth birthday celebrations in April 1997. With that soon to be in place and sponsorship from Toshiba already in its third year (the official logo has been ‘ICA sponsored by Toshiba’ since 1993), the ICA has clearly changed from its early ‘adult play-centre’ days. Now Britain’s largest showcase for contemporary art and one of the country’s primary arenas for cultural debate, it is less of a testing ground and experimental space for emerging artists than at its inception, and has over the years acquired its own history and established its own cultural position. The ICA today provides a different kind of space, where its own identity has become part of the equation and design is no longer a natural extension of the artists’ work. It is now part of a well-calculated marketing strategy, but there is still room for a designer’s creativity to be employed. This gradual shift reflects the ambiguous position of design, but also highlights its most important aspect – integrity – whether it is being used as a marketing tool or for artistic expression.